Within the audiobook of The Trail of Ted Bundy: Digging Up the Untold Stories, you'll hear the voices - many for the first time - of some of Ted Bundy's friends as they bring to light the secrets of what is was like to know him while he was actively involved in murder. The stories of his victims are here as well, as told by their friends, including the information and anecdotes that didn't make it into the investigative files and are being published here for the first time. Two of the former detectives who worked with author Kevin Sullivan during the writing of his widely acclaimed book return to aid listeners in fully understanding Bundy's murderous career, its ripple-effect impact on those who came into contact with him in one way or another, and dispelling commonly held myths. The Trail of Ted Bundy is a journey back in time, to when Ted Bundy was killing young women and girls in the Pacific Northwest and beyond. It's told by those who knew him, and you'll hear their revealing stories, many being voiced for the very first time. Friends of the victims are here as well, and they, too, share their insights about the victims, and some of what they tell here had been held back from the investigators, such was their commitment to their deceased friends. It's also the story of those who hunted Bundy, those who guarded him, and those who otherwise were parts of this strange case one way or another. Where does The Trail of Ted Bundy: Digging Up the Untold Stories rank among all the audiobooks you’ve listened to so far? This is a very good True Crime book. It is a follow up to another book about the Ted Bundy murders. It is great because it uncovers little known details for those who are well-versed in the history, but it is not necessary to know anything in order to follow the book. This is a true story so my favorite character is a real person--Melissa Smith's little sister. She was frustrated by the lack of investigation into her sisters murder. She helped the only investigator by rounding up all the people on his list and bringing them to him. She filled up his waiting room. That is a productive use of frustration. Way to go kid. Kevin Pierce has a great voice that is particularly suited to the True Crime genre. He gave an excellent performance as always. Finding out the details behind why Lynette Culver (Bundy's 12 year old victim) was killed was very sad. It was also very well written. 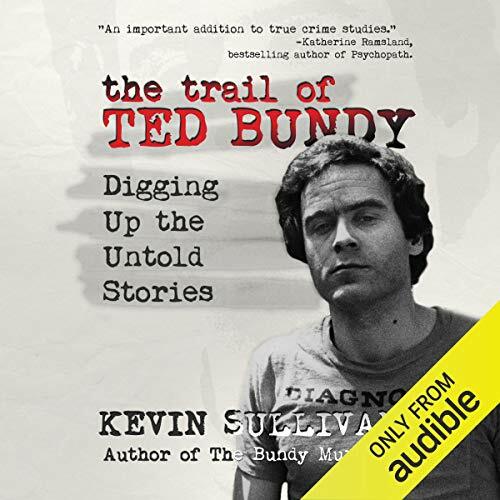 Author Kevin Sullivan has previously written a history of Ted Bundy, going through Ted childhood, the murders and trial. Once that book was published more people who knew Bundy came out of the woodwork to talk to Sullivan, thus creating the need to update his book with the new information. Rather than update as a revised edition Sullivan has created this second book, a sequel of sorts, that updates and fills gaps. There are pros and cons of a new book vs just doing a revision (people who bought the first don't have to get a second updated copy) but for me it was an issue. It wasn't clear to me when I picked this book up that it was a supplement to another book, thus I came away a bit disappointed with the results. Sullivan doesn't spend much time with details covered in the prior book, except when his new evidence and information need it covered. As such it is assumed that a lot of the players in the story - the detectives and possible victims - are known to the reader. The content is then small vignettes dispersed throughout Bundy's career, without a strong narrative flow between them. Even with this being the case I was able to follow along and put together at least some idea of who Bundy was an how he operated. It is both scary and interesting. Sullivan has clearly done some great research and presents a good understanding of Bundy and what made him tick. He deals with the conjecture and unknowns well. I've now put Sullivan's other book into my "to read" list. But in the end I wish I read them in the correct order. Narration by Kevin Pierce is solid. He's easy to understand and follow, with good pacing. He lends himself to reading non-fiction well and makes the book an enjoyable listen. Sadly, I wasn't impressed. Every 10 to 15 minutes he referred to his first book. "You can find that in my best selling book..." Wasn't able to concentrate on the actual story because you weren't able to forget that he has another book. A summary of his other book. While the author is an expert on Bundy, his previous book was perfectly sufficient and could have simply been updated with an extra chapter. Unfortunately this book mostly just summarizes The Bundy Murders (it is not recommended if you haven't read it) and the author mentions it so often that it becomes annoying very quickly. There is not much that is new or added as suggested, over all it was disappointing. The narrator was amazing as usual though. There is virtually nothing new in this book. It’s ridiculous that the author is so shamelessly publishing it and accepting royalties. I can count the new things I learned on one hand. So Bundy went to Denny’s regularly. Who cares? He also describes traveling to different murder sites and sadly imagining how such horrific acts could occur. Seriously, don’t waste your money. Thank goodness Audible allows returns. Sounded more like a promo for his other book. I've always enjoyed books by this author but I really didn't get the reason for this book. While there was some new information about Bundy, for the most part I thought he basically stated information already given in his The Bundy Murders book. The constant references to to his previous book got old real fast. What did you love best about The Trail of Ted Bundy: Digging Up the Untold Stories? If you could sum up The Trail of Ted Bundy: Digging Up the Untold Stories in three words, what would they be? I appreciated this audiobook for the same reason I appreciate audiobook's on history: because it teaches me something about human behavior, as well as my own behavior. As convenient as it may be to think we are "nothing like" Ted Bundy-or others like him-the truth is that if you were to change a few circumstances and conditions, any one of us could be just like him. That having been said, what a monster Ted Bundy was. As tragic (and meaningless) as his legacy was, the fact that he was able to escape from jail a SECOND TIME due to jailer incompetence was doubly heartbreaking. This is a thorough and engaging audiobook on a very, very bad human being. Another great Bundy book by Kevin Sullivan! A great followup book to Kevin's first Bundy book!His thorough research and attention to detail are truly amazing. Great job Kevin! What other book might you compare The Trail of Ted Bundy: Digging Up the Untold Stories to and why? This is the first book I have ever read from this genre (a closer look at a criminal). After finishing, I would say that this is not necessarily my preferred genre. However, I did find that this relatively short work was just right for me. I was curious to know a bit more about Ted Bundy- but I would not have been willing to spend many hours on the topic. The performance was quite adequate. It was delivered relatively "flat", but the style fit the topic well. The description of the murders of course tug at your heart. However, the author does a good job of not being more graphic than necessary. The mental evaluations of Bundy at the end of the book were also very interesting. I received this Audible book for free in exchange for an unbiased review.